The ruins of a village from the Israelite period, famous with its holy rock-cut tombs of distinguished Jewish Rabbis starting from the Byzantine period. This village is located east to Kh. Tel Beer Sheba (of the Galilee), and was inhabited since the Israelite period. The site is famous with its many holy graves of distinguished Jewish scholars from the Roman period. The Jewish population lived here continuously for 25 centuries until the 16th C AD. The ruins of the village are located on a low hill above the ancient west-east road that connected Acre to the Sea of Galilee. It is located on the east side of Khirbet Beersheba. Tomb R. Eliezer - adjacent to the #85 road, and accessible by a staircase. The aerial map below shows the major points of interest. Pointing and clicking on selected points in purple will automatically scroll to the relevant photo or site. The hill above the nearby village (Beer Sheba of the Galilee) was fortified by Josephus Flavius in preparation for the Roman conquest at the Jewish Revolt in 67AD. Kefar Hanania may have started as a pottery shop and food supply for the fortress during the revolt and until the 3rd C AD. After the fall of Galilee, the fortress on top of the western hill of Beer Sheba declined. Its population moved down to a more accessible site, closer to the ancient road and sources of water and agriculture. 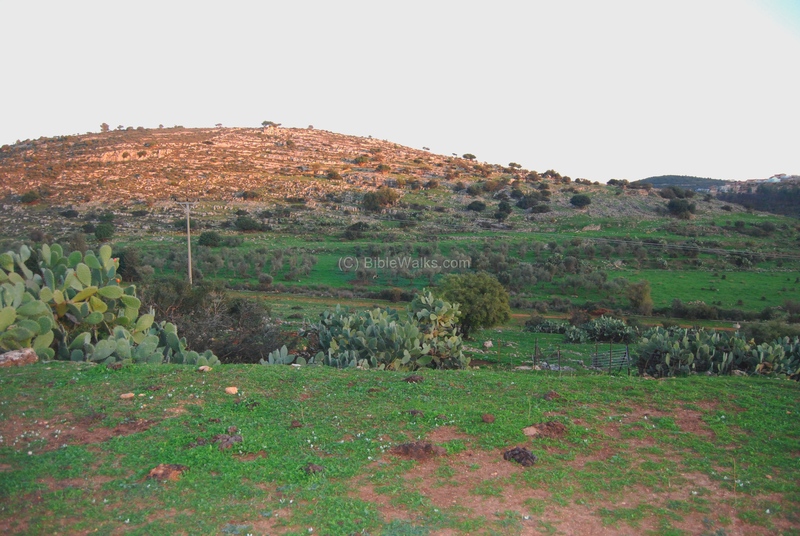 The new village of Kefar Hanannia prospered in the Roman/Byzantine period, and continued until recent times. It was based on farming the fields around it, and on pottery which made it famous. Today, the ancient village of Kefar Hannania is in ruins, but the tombs are visited by many religious groups who come here to pray. In the last 10 years there is a rise in the number of people that come to Holy tombs, a phenomenon that is hard to explain. Dozens of such sites were rebuilt and revisited after many years of neglect. Every weekend there are hundreds of believers that tour the Tomb sites around Israel, asking for hearing their prayers. See other sites, like Benjamin tomb. A western view of the ruins of Kefar Hannania was captured by a drone at late summer. Highway #85 is located on its south side. In the far right background, southeast of the site, is the modern communal settlement of Kfar Hananya, established in 1977 and named after the ancient site. A view of the ruins of the village, taken from the south side. The ruins are of the Arabic village, which is built over the Roman Jewish village. Another closer view of the site. The hillside is dotted with many fragments of ceramics, more than the typical Roman sites. This is due to the fact that in Roman period the village was known for its ceramics industry, since the soil in the Salmon creek, near the village, was ideal for ceramics. 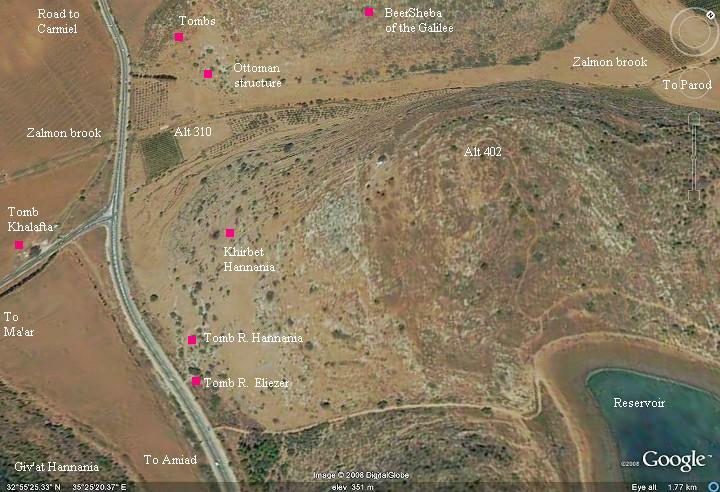 One of the furnaces was located at the foothills of Khirbet Beer Sheba, across the creek. This view is towards the south - the edge of Hannania valley. On the left hill is a new settlement - Givat Hannania (established 1978), which preserved the old village's name. Behind that hill is the old road that reaches the Netufa valley. This was probably the ancient route as well, that passes south through the Arab village Ma'ar, and there it split south (through Eilabun to Khirbet Netufa and Khirbet Ammudim) and east (through Khirbet Ravid to Magdala and the sea of Galilee). A west view of the site is seen below, from the foothills of Khirbet BeerSheba. The Zalmon brook flows between the two hills, from left to right. The ruins of the ancient site are seen scattered along the right (south) side of the hill. On the far right background are the modern houses of Givat Hannania. There are several series of rock-cut tombs on the southern side of the hill. The closest tomb near the road, seen in the background of this photo, is attributed to Rabbi Eliezer Ben Yaakov, nicknamed "Kav ve Naki", or "simple & small", as were his teachings. Another view of the tomb: the sign with his name (and other "pious" persons that are buried with him). For some reason the plate is broken in the sub text - maybe someone disagreed with the words. Inside the tomb there are rock cut tombs, and people come here and light candles. This tomb, identified as the tomb of Rabbi Hannania Ben Ashkia, is typical for the late Roman period (aka the period of Mishna and Talmud). The tomb is cut into the rock, and inside the tomb, on each of the three sides, there are five cavities for the bones. Another view of the tomb is seen below. Notice that outside of the tomb, hanged over the branches of the bush in the background, are pieces of cloth that are hanged on a rope. This is a common practice around Holy places. West to this tomb was the Roman synagogue, a rectangular building of 11.5 x 12.25M, facing south towards Jerusalem. Its south and north walls are cut into the hill. A small rock-cut pool is located near the entrance, and was used for purification or as a Mikveh (Jewish baptism). The tombs of Rabbi Abba Khalafta and his two sons are located on the eastern side of Hannania valley, on the other side of the road, under a large tree which is south to the junction. This gall oak tree is about 500 years old, one of the oldest and largest in Israel. It survived the wood chopping due its location in a holy place. The rabbi lived in the end of the 2nd C AD and was one of the famous scholars in Kefar Hannania. He was a Tenneh - a teacher (in Aramic) which was a rabbinic authority in time of Mishna (during the Roman period). People came here to pray and ask for cures or salvation. In the middle ages Jews and Arabs alike brought their sick relatives to sleep near the holy tombs, in hope for a cure. Hannania - name in Hebrew: "God (-ia) has pardoned (Hannan-). Kefar - in Hebrew: village. Givat Hannania - Givah means in Hebrew "hill"